On this Week 9 edition of Around the Brackets, we’ll recap first-round playoff action from Thursday and Friday night. Gardner-Edgerton 55, Blue Valley Northwest 27 – Top-seed Gardner-Edgerton scored 28 points in the second quarter to pull away from Blue Valley Northwest. The Blazers rushed for 310 yards on the night led by Jacob Hunsperger’s 153 yards and three scores. Luke Jennings added 75 rushing yards and a touchdown, and caught a 65-yard touchdown pass from Teven McKelvey. McKelvey passed for 96 yards and a touchdown, rushed for 60 yards and a touchdown, and caught a 27-yard touchdown pass from Tyler Goetzmann. Blue Valley Northwest freshman quarterback Mikey Pauley passed for 244 yards and three touchdowns in defeat. Shawnee Mission Northwest 35, Shawnee Mission North 28 – Shawnee Mission Northwest receiver Dale Talley made a one-handed touchdown catch on a 23-yard pass from Ty Black to give the Cougars a 35-28 lead with 1:08 remaining. The Cougar defense then intercepted Shawnee Mission North quarterback Zach Bush and ran out the clock for the victory. SM North jumped out to a 21-0 lead before the Cougars scored 28 consecutive points to take a 28-21 lead. The Indians scored to tie the game and set up Talley’s late-game heroics. Shawnee Mission South 40, Olathe Northwest 21 – Shawnee Mission South outscored Olathe Northwest 26-7 in the second half in winning 40-21. Quarterback Jack Roberts rushed for three touchdowns in the second half to break a 14-14 tie. Nolan Thimmesch added a touchdown run late in the fourth quarter to secure the win. The postseason victory was the first for the Raiders since 1990. Blue Valley North 68, KC Wyandotte 12 – The 5-seed Mustangs had little trouble with 12-seeded Wyandotte as part of a record-scoring night. Blue Valley North scores four times in each of the first and second quarters in rolling to a 55-6 halftime lead. Graham Mertz passed for 360 yards and six touchdowns in the victory – two each to Shawn Hendershot and Amauri Pesek-Hickson. Cameron Burt led the Mustangs with four catches for 121 yards and his 16th receiving touchdown of the season. Shawnee Mission East 45, KC Harmon 0 – Shawnee Mission East cruised to a 45-0 victory over KC Harmon on Thursday night. The Lancers led the Hawks 45-0 at halftime. Harmon has now dropped 30 consecutive games dating back to 2015. Olathe East 31, Blue Valley 21 – Olathe East, the 10-seed, jumped out to a 17-0 lead and held on to beat Blue Valley, 31-21. Hunter Thomas passed for 236 yards and three touchdowns to lead the Hawk offense. Receiver/defensive back Ray Lewis caught four passes for 152 yards and two touchdowns, and on the other side of the ball, intercepted Blue Valley quarterback Walker Kinney three times. Kinney rushed for 150 yards and Alex Totta added 146 yards and two scores on the ground along with a receiving touchdown. Olathe North 56, Shawnee Mission West 14 – Olathe North scored 42 points in the first half in wasting little time advancing past Shawnee Mission West. Arland Bruce, IV threw three touchdown passes in the first half and added a rushing score. Olathe South 54, Blue Valley West 41 – Olathe South scored four times in the third quarter to pull away from Blue Valley West as part of a 54-41 win. The Falcons led the Jaguars 24-20 at halftime before a 27-7 third quarter that extended their lead to 51-27. Blue Valley West quarterback Greg Riddle passed for 297 yards and two touchdowns with 205 yards and both scores going to David Brown. Derby 41, Lawrence 7 – The top-ranked Panthers remained undefeated and led Lawrence, 41-0, after three quarters. Derby had four turnovers late in the first half and a fifth in the third quarter. The Panthers opened the scoring with a 11-yard TD pass from Hunter Igo to Jacob Karsak. Then, Karsak added a 19-yard scoring run, followed by a six-yard scoring run from Tre Washington. Dodge City 25, Junction City 15 – Dodge City defeated Junction City, 25-15, in a home win and gets Derby in the next round. The Red Demons have won four straight and is plus-eight in turnover margin in the stretch. It marked the first first-round playoff win for the Red Demons since 2012. The game’s last touchdown was scored with 4:32 left in the third quarter on a 10-yard scoring pass from John Johnson to Beau Foster. Dodge City led 19-7 at halftime against Junction City. Topeka High 45, Hutchinson 43 – Topeka High survived a scare from 13-seed Hutchinson, but kicker Gregorio Leonardo booted a game-winning 24-yard field goal with :35 seconds remaining to deliver a 45-43 victory for the Trojans. Hutchinson built a 28-9 halftime lead after the Salthawks used a ball-control offense, an onside kick, and a turnover to keep Topeka High’s offense off the field. Topeka scored twice out of halftime on touchdown runs by Jacqez Barksdale and Ky Thomas to pull within 28-23. Hutch would answer to lead 35-23 before Barksdale scored consecutive touchdowns to give Topeka a 36-35 lead. After a fumble, Thomas scored on a short run to extend the Trojan lead to 42-35. Hutchinson then regained a 43-42 lead on Patrick Grabener’s touchdown run and his successful two-point conversion. That set up Leonardo’s game-winning field goal. Grabener rushed for 193 yards for the Salthawks, while Thomas ran for 164 yards and Barksdale added 163 yards for Topeka High. Washburn Rural 21, Garden City 7 – Jordan White compiled more than 350 yards of total offense in Rural’s 21-7 win over Garden City. White rushed for 125 yards and a touchdown, and passed for 230 yards, including two touchdowns to Preston Williams. Williams. Lawrence Free State 61, Wichita North 18 – For Free State, Ben Miller blocked a punt, collected his own fumble and scored the game’s first points. L.J. Mack had 61-yard punt return. Jax Dineen cleared 1,000 rushing yards this year with six touches for 130 yards. Senior quarterback Jaxson Webb again played in place of injured starter Malik Berry. The game had a running clock. Wichita North, one of the state’s surprises with a 2-0 start, lost its final seven games of the year including 37- and 43-point margins in its last two games. Haysville Campus 57, Wichita South 7 – Campus led Wichita South 29-7 early and had no trouble advancing to take on Free State next week. The Colts have now posted a one-win improvement over a breakthrough 5-5 season last fall. Campus has its best season since 2005. Manhattan 73, Wichita Southeast 20 – Wichita Southeast scored on the game’s first play before Manhattan quickly regrouped and scored 44 points in the first half. It marked Manhattan’s most points since 2013. Kevontae McDonald finished with 31 carries for 219 yards and three scores. Sophomore quarterback Dayne Aschenbrenner caught 7 of 11 passes for 137 yards and three scores. Wichita West 47, Wichita East 0 – Wichita West defeated East for a second-consecutive week and earned the schools’ first playoff win in 17 years. The Pioneers beat East 28-7 last week. St. Thomas Aquinas 69, Topeka Highland Park 14 – Top-seeded Aquinas had little trouble in handing Highland Park its 43rd straight defeat. The Saints scored 55 points in the first half and rushed for 345 yards in the game. Charlie McCormick led the Saints with 51 rushing yards and three scores. Five other running backs scored for the Saints. Topeka Seaman 52, KC Sumner Academy 20 – Seaman built a 38-6 halftime lead in rolling past Sumner, 52-20. Kobe Jones passed for 97 yards and two scores and rushed for two more touchdowns. Mill Valley 49, Topeka West 10 – Mill Valley scored 35 points in the first half in dispatching of Topeka West, 49-10. Jordan Preston passed for 175 yards and three scores, while Tyler Green added 121 yards rushing and two touchdowns. St. James Academy 34, Lansing 27 – St. James Academy, the 12-seed, pulled off the upset on paper with a 34-27 victory over Lansing. The Thunder outscored the Lions 13-6 in the second half to provide the difference. The victory is just St. James’ second on the season. De Soto 49, KC Turner 7 – De Soto rolled past Turner for a second time this season. Keegan Sturdy rushed for two scores and caught a touchdown pass from Aaron Mackay to lead the Wildcats. Shawnee Heights 10, Blue Valley Southwest 9 – Manny Salamanca kicked a 39-yard field goal early in the fourth quarter to give Shawnee Heights a 10-9 lead – a lead that would hold up in the T-Birds first-round win. The T-Birds scored on a Hunter Wohler touchdown run to take a 7-6 lead before Southwest’s Dominik Stadlman connected on his third field goal of the game to give the Timberwolves a 9-7 lead at halftime. KC Schlagle 46, Leavenworth 28 – Schlagle won its opening-round game for a third consecutive season. The Stallions beat Leavenworth to advance to a home matchup with Olathe West next week. Olathe West 27, KC Washington 20 – Olathe West picked up the school’s first-ever postseason victory by topping KC Washington 27-20. Gavan McDaniel rushed for a pair of scores as the Owls took a two-score lead late in the third quarter. Washington would add a late score to pull within a touchdown. Wichita Northwest 58, Salina South 24 – Northwest led 51-10 after three quarters and had no trouble with struggling Salina South. Northwest led 6-0 just 51 seconds into the contest after a 16-yard run from Breece Hall. Emporia 35, Wichita Heights 17 – Emporia limited Heights to 10 points in the final three quarters and won its first postseason contest in two years. Senior Hayden Baumwart delivered two big touchdown-saving tackles on defense. Tyler Lindquist rushed for 98 yards. Emporia, after multiple close losses earlier in the season, has won two in a row, moved to 5-4 and has a one-win improvement over last fall. Bishop Carroll 40, Newton 34 – Jackson Nichols rushed for 283 yards and three touchdowns as Bishop Carroll held off Newton 40-34. Railer quarterback Colton Davis passed for 218 yards and four touchdowns and nearly led his team to an upset of the defending 5A champions. Salina Central 20, Goddard-Eisenhower 6 – Salina Central defeated Eisenhower for a second time this season after topping the Tigers 44-7 in the opener. Jackson Kavanagh threw two touchdown passes as all of the scoring took place in the first half. Eisenhower’s Marc Marinelli announced his resignation after the game. Maize 56, Liberal 15 – Maize led 14-0 after the first quarter and 42-0 at halftime. Caleb Grill enjoyed a huge night against a Redskin squad that ended the season with eight straight losses and did not defeat a Kansas team this fall. Caleb Grill completed 34 of 44 passes for 473 yards and four scores. Maize outgained Liberal, 639-192. The Eagles play host to rival Maize South next week. Maize South 21, Andover 17 – Maize South won its sixth straight game after a 0-3 start and avenged a 20-3 home loss to Andover in Week 2. Maize South gets rival Maize next week. Maize South is 2-0 versus the Eagles with the last matchup coming in 2015. Great Bend 35, Valley Center 18 – Koy Brack passed for two touchdowns as Great Bend eliminated Valley Center, 35-18. The Panthers were led on the ground by Gage Fritz and Dalton Miller. Fritz rushed for 180 yards, while Miller added 115 yards on the ground. Kapaun Mt. Carmel 48, Hays High 28- Kapaun defeated Hays High, 48-28. Hays led 28-27 entering the fourth quarter after a trick play on fourth down yielded an eight-yard scoring pass. Kapaun senior Scott Valentas tallied 12 rushes for 182 yards and three scores. Hays held a slight edge in total yards, though finished with four turnovers. Kapaun was plus-two in turnover margin. Hays High committed 24 turnovers in a 3-6 season, while the Crusaders moved to 7-2. Palmer Hutchinson completed 19 of 32 passes for 259 yards with two touchdowns against two interceptions for the Indians. Louisburg 56, Ottawa 8 – Top-seeded Louisburg cruised to a second victory over Ottawa in the past three weeks. This time the Wildcats were much more dominant as Brandon Cooper returned the opening kickoff for a touchdown. Louisburg beat Ottawa 25-0 in Week 7. KC Piper 46, Bonner Springs 40 – Piper defeated Bonner Springs for a second consecutive week, although the Braves made things much closer this week. Piper broke a 40-40 tie with a touchdown and then held Bonner Springs on fourth-down inside the 10-yard line with under a minute to go. Piper beat Bonner Springs 69-20 a week ago. Pittsburg 37, Spring Hill 15 – Pittsburg needed just two plays to score on its opening drive and the Dragons maintained control for much of the night in defeating Spring Hill. Next week, the Purple Dragons get a huge home showdown with top-ranked Bishop Miege at Hutchinson Field. Bishop Miege 76, Labette County 8 – Bishop Miege rolled to a home victory over Labette County for a second consecutive year. The Stags led 28-0 after the first quarter and 62-0 at halftime. Sam Pedrotti threw touchdown passes to three different receivers and added a touchdown run. Linebacker Dylan Downing scored twice in the first half on a pick-six and an strip and fumble return for a score. Basehor-Linwood 44, Eudora 16 – Basehor-Linwood shutout Eudora 23-0 in the second half to win 44-16. The Bobcats led 21-16 at the break. Dylan Mussett passed for 250 yards and a score and Marlon McDaniel rushed for 92 yards and three touchdowns. Fort Scott 40, Atchison 12 – Dalton Colvin rushed for 161 yards and a touchdown and added a interception return for another score as Fort Scott eliminated Atchison. The Tigers scored in each quarter and forced four Redmen turnovers. Paola 45, Baldwin 6 – Paola rebounded from last week’s loss to Louisburg by beating Baldwin for a second time this season. The Panthers got two rushing touchdowns a piece from Brendan Ohlmeier, Connor Hasz, and Seth Richmond. Tonganoxie 48, Chanute 36 – Tonganoxie led Chanute 19-7 in the first half before the Blue Comets score, then got a pick-six to lead 21-19 at halftime. The Chieftains then took control in the second half and pulled away for the win. Drake Pray scored a rushing touchdown, and after a Chanute turnover, Korbin Riedel added another score to give Tongy a 35-21 lead. McPherson 71, Independence 13 – Top-seed McPherson had little trouble with winless Independence. The Bullpups scored 32 points in the first quarter and 33 more in the second. Jace Kinnamon rushed for 214 yards and two touchdowns to lead the Bullpup ground game. Kyler Hoppes passed for 326 yards and six touchdowns on the night. Gabe Hoover caught seven passes for 94 yards and three scores. Ulysses 28, Abilene 0 – For the second straight week, Ulysses made the long trip to Abilene. Last week, the Tigers lost 26-21 to Abilene. This week, Ulysses shutout the Cowboys, 28-0. In Week 7, Ulysses went all the way southeast to Labette County for a 35-22 victory. The Tigers are 4-4 and have a three-win improvement after the tragic passing of longtime successful coach/athletic director Jason Kenny in the summer. Arkansas City 29, Mulvane 26 – In possibly the state’s biggest upset, Arkansas City defeated Mulvane. Ark City trailed 26-21 with four minutes left in the third quarter. Then, the 3-6 Bulldogs took a 29-26 lead with three minutes left in the fourth quarter. Mulvane finished 6-3 after it led 20-14 at halftime. Mulvane quarterback Tab Creekmore exited early in the game with what appeared to be a serious leg injury. Coffeyville 46, El Dorado 12 – Coffeyville picked up its first post-season win since the 2013 state runner-up finish. The Golden Tornado led 16-6 at halftime and scored 30 points in the second half in pulling away. Wellington 38, Rose Hill 13 – Wellington defeated Rose Hill for the first time this year. RH took an early 7-6 lead before Wellington tallied 18 straight points. The 7-2 Crusaders won at Rose Hill, 38-7, in Week 5. Buhler 25, Winfield 0 – A week after edging Winfield 28-21, Buhler shut out the Vikings 25-0 to advance to the second round. The Crusaders scored once in each quarter on Friday to gradually pull away from Winfield. Goddard 46, Towanda-Circle 6 – Ben Bannister rushed for three touchdowns and scored on a screen pass from Kyler Semrad as the Lions blasted Circle, 46-6. Andover Central 16, Augusta 7 – Andover Central won a low-scoring game over Augusta for a second time this season, scoring 13 points in the second half to win 16-7. The Jaguars held August to 27 rush yards on 32 attempts. Andover Central gets a rematch with Goddard after falling to the Lions, 17-16 in overtime earlier this season. Galena 40, Anderson County 0 – Galena had little trouble with Anderson County on a cold, rainy night at Abbey Field. Quarterback JC Shelton rushed for two short touchdowns and threw a touchdown pass to Blake Booth as the Bulldogs led 28-0 at halftime. On the first play of the third quarter, Shelton hit Nick Sarwinski on a 66-yard touchdown pass for a 34-0 lead. Sarwinski scored on a short touchdown run a few minutes later to start the running clock. Frontenac 33, Burlington 6 – Frontenac went on the road and set the tone early with two, first-quarter scores en route to a 27-point victory at Burlington. Jake Beckmann hit Ryan Raio on a 14-yard touchdown pass then rushed for a 4-yard score in the first quarter. The Raiders then scored on the final play of the first half on a 30-yard reverse-throwback pass from Raio to Beckmann. The Raiders scored twice in the second half on an Alex Johnson short touchdown run and a 63-yard sprint by Beckmann. Topeka Hayden 28, Holton 7 – Hayden’s Will DeVader scored on three short rushing touchdowns to allow the Wildcats to advance past Holton. Hayden led 7-0 at halftime and DeVader added two scores in the third quarter. Marysville 40, Santa Fe Trail 17 – Marysville outscored Santa Fe Trail 16-0 in the second half to advance to the next round. Brandon Schroedl rushed for two touchdowns and threw a touchdown pass for the Bulldogs. Atreyau Hornbeak also added a pair of rushing scores for Marysville. Prairie View 27, Caney Valley 7 – Prairie View built a 14-0 first-quarter lead and held off Caney Valley, 27-7. After Caney pulled to within 14-7, Prairie View’s Hunter Boone broke an 85-yard touchdown run to put the Buffaloes back up two scores. Parsons 6, Girard 0 – Parsons picked up the schools’ first playoff victory in 42 years with a 6-0 win against Girard. Early in the third quarter, Parsons quarterback Gage Friess lined up next to DaQuan Johnson on a fourth-and-2 play. Johnson handed to Friess, who broke three tackles and sprinted down the left sidelines 45-yards for the game’s only score. The Vikings and Trojans played a scoreless struggle for much of the night with Girard controlling the ball, but unable to convert a couple of drives in to points. Sabetha 32, Jefferson West 7 – Joe Gruber rushed for two touchdowns as defending 3A champion Sabetha opened the playoffs with a 32-7 win over Jefferson West. The Blue Jays led 18-7 at halftime and scored twice in the third quarter to pull away. Perry-Lecompton 34, Wamego 20 – Dalton Kellum scored four touchdowns as Perry-Lecompton earned a rematch with Sabetha by defeating Wamego, 34-20. William Welch passed for two scores, one to Kellum, and an 80-yard bomb to Colton Mallonee. In one of the highlights of the season, Cody Wanklyn, a Wamego senior with Down syndrome, scored on a 59-yard touchdown run at the close of the game. WATCH – Wamego senior Cody Wanklyn’s TD run! Smoky Valley 43, Cheney 6 – Smoky Valley remained undefeated after it picked off five passes, including a pick-six. Smoky Valley has permitted just 69 points this season. The Vikings have captured nine wins for the second straight year. Another victory would give the Vikings its best season since a 10-1 mark with then-coach Gary Sandbo, the father of current Salina Central coach Mark Sandbo, according to Kansas Football History archives. Hesston 42, Wichita Collegiate 28 - Hesston beat Wichita Collegiate, 42-28. Cameron Cox enjoyed a big game with 13 of 20 passing for 205 yards and three TDs. He also rushed 23 times for 143 yards and a score. Three players caught a touchdown pass, and Parker Roth and Max Arnold each rushed for a TD. Collegiate quarterback Gabe Fisher completed 18 of 33 passes for 275 yards and three scores. Pratt 52, Concordia 27 – Pratt remained unbeaten with another big offensive performance from Travis Theis. Theis rushed for five touchdowns that totaled 214 yards themselves. The Greenbacks will host Colby next week. Colby 51, Kingman 21 – Colby improved to 8-1 with a big win versus Kingman. The Eagles have a two-win improvement, and its best season since before 2004. Colby led 22-7 after the first quarter and 28-7 at halftime. The Eagles have improved their win total for a sixth straight season. Andale 35, Halstead 0 - Andale recorded its sixth shutout this season by beating Halstead, 35-0. Sawyer Simon rushed for 106 yards to lead the Indians, while Mac Brand and Ethan Baalmann each rushed for two touchdowns. Andale led 14-0 at halftime and scored twice in the third quarter to put the game out of reach. Scott Grider led Halstead with 137 yards on the ground. Chapman 48, Clearwater 14 – Blake Vercher rushed for four touchdowns as Chapman pulled away from Clearwater with 34 points in the second half. Izek Jackson also added a pair of short touchdown runs for the Irish. Scott City 38, Nickerson 0 - Scott City defeated Nickerson, 38-0. All of the points were scored by the 10:55 mark in the game. Scott City led 28-0 at halftime. The Beavers’ big drive was 13 plays for 97 yards that ended on a one-yard run from Wyatt Hayes for a 22-0 lead. Scott City tallied 356 yards of total offense. Brandon Winderlin rushed five times for 100 yards and two scores. Hayes had 21 carries for 97 yards and two touchdowns. Nickerson had just 72 yards of total offense. Beloit 28, Hugoton 0 – Beloit went 267 miles south and shutout Hugoton – a surprise playoff team under first-year coach Nick O’Loughlin. The Trojans led 14-0 at the end of the third quarter. Tate Ahlvers scored twice in the fourth quarter, including a 37-yard run. Beloit led 7-0 at halftime. Hugoton turned it over on the first play of the second half, and Beloit scored on a six-yard run from Grant Arasmith. Humboldt 52, West Franklin 15 – Humboldt trailed for the first time this season after an early Falcon touchdown, but Dagen Goodner rushed for three touchdowns as the Cubs gained control with a 30-15 halftime lead. Humboldt added three scores in the second half to win 52-15. Goodner scored four times on the ground, while Conor Haviland rushed for three scores. Osage City 28, Southeast-Cherokee 6 – Osage City advanced to the next round with a 28-6 victory over Southeast-Cherokee. The Indians led 8-6 after one quarter and 21-6 at halftime before adding another score in the third quarter. Southeast finished 4-5 on the season after having entered the year having lost 28 straight games. Maur Hill 27, Mission Valley 18 – Maur Hill rallied from an 18-7 halftime deficit to top Mission Valley, 27-18. Jack Caudle tossed a pair of touchdown passes as the Ravens scored twice in the fourth quarter to overtake the Vikings. Rossville 36, Pleasant Ridge 14 – Rossville outscored Pleasant Ridge 20-6 in the second half to pull away for the victory. Garrett Carver passed for two touchdowns and rushed for a third score for the Bulldawgs. Silver Lake 66, Riverton 0 – Silver Lake had little trouble with Riverton in a 66-0 victory on Thursday night. The Eagles only led the Rams 6-0 after the first quarter, but expanded that lead to 36-0 at halftime. Silver Lake then poured on three more scores in the third quarter to lead 58-0. McLouth 48, Jayhawk-Linn 26 – McLouth shut out Jayhawk-Linn in the second in pulling off the 48-26 road victory. The Jayhawks led 26-24 at halftime, but McLouth scored 24 points after the break to pick up its first playoff win since 2012. Riley County 45, Riverside 0 – Riley County built a 31-0 halftime lead in rolling past Riverside. Garrett Harmison threw three touchdown passes and Tristan Kulp rushed for two scores to lead the Falcons. Southeast of Saline 26, Nemaha Central 13 – Southeast of Saline moved to 8-1 and doubled its win total from last fall with a 26-13 victory against Nemaha Central and its first playoff win since 2006. The Trojans tallied all of their points in the first half. The Trojans won eight contests for the first time since 2011. Jaxson Gebhardt completed 12 of 17 passes for 150 yards and 55 rushing yards. Garden Plain 45, Douglass 6 – The Owls defeated Douglass for the second time this season and is the only team to beat the Bulldogs this year. Garden Plain beat Douglass, 31-0, in Week 2. Four different backs score on Friday as Garden Plain rushed for 277 yards led by Dylan Hahn’s 83 yards and a score. The Owls held Zach Dressler to 57 yards rushing and a touchdown on 20 attempts. Hutchinson Trinity 58, Belle Plaine 0 – Hutchinson Trinity defeated Belle Plaine, 58-0. Kaleb Hammeke returned a punt 66 yards for a 14-0 lead. Then, Nolan Clarke had a pick-six from 40 yards out for a 22-0 advantage. The Celtics bumped the advantage to 30-0 in the first quarter on a 50-yard throw-catch-lateral for a touchdown. Cimarron 52, Ellsworth 14 – The Bluejays won its eighth straight contest and third consecutive district championship. Cimarron led 8-0 after the first quarter and 30-0 at halftime. Sophomore Tate Seabolt had 36 carries for 183 yards and two scores. Senior Oscar Macias finished with eight carries for 93 yards and two TDs. Cimarron rushed for 366 yards and six TDs, and, including 114 passing yards from Dylan Harrison, churned out 480 yards of total offense. Hoisington 38, Sterling 13 – Hoisington eliminated Sterling behind a big night from Josh Ball. Ball rushed for 118 yards and three scores to help the Cardinals advance to take on Cimarron. Conway Springs 66, Eureka 6 – Conway Springs score 42 points in the first quarter in remaining unbeaten. Eureka, which had to play its entire season on the road because of damaged sustained to its stadium from a tornado this summer, qualified for the playoffs for the first time since 2013. Chaparral 55, Fredonia 0 – Jake Burke passed for four touchdowns and rushed for three more scores as Chaparral rolled to a dominating 55-0 victory at Fredonia. The Roadrunners led 27-0 after one quarter and 41-0 at halftime. Phillipsburg 55, Southwestern Heights 12 – Phillipsburg scored four times in the first quarter in cruising past Southwestern Heights. The Panthers led 48-0 at halftime and eventually 55-0 before SW Heights scored a couple of touchdowns. Lakin 44, Norton 14 – Lakin defeated Norton, 44-14, and won its first playoff game since 1999. Lakin quarterback Juan Banuelos rushed for 187 yards and passed for 89. Lakin (8-1) trailed 8-6 at the end of the first quarter. Norton scored first on a nine-yard run from Kade Melvin, and then Banuelos broke loose for a 57-yard scoring run. Norton tied the game late in the first half at 14 before Banuelos threw a 52-yard scoring pass with 53 second remaining in the first half. Kayden Christiansen rushed for two second half scores, and Hadley Panzer recovered a key fumble, one of four Norton turnovers. St. Mary’s Colgan 68, Leon-Bluestem 8 – Colgan rolled past Bluestem on a rainy night at Hutchinson Field in Pittsburg. The Panthers scored five times in the first quarter to lead 35-0 and added three more touchdowns in the second for a 56-0 lead. Cade Simmons, Kash Marietta, and Conor Price each rushed for two scores for the Panthers. Hillsboro 75, Yates Center 20 – After trailing 7-6 early, Hillsboro scored eight more times in the first half to beat Yates Center, 75-20. Trojan quarterback Jorge Handshu threw three touchdown passes and rushed for another 80-yard score. Hillsboro will travel to Pittsburg next week to take on Colgan in a game to be played at Pittsburg State’s Carnie Smith Stadium. Jackson Heights 36, Northern Heights 28 – Fifth-ranked Jackson Heights avoided a major upset by scoring 20 points in the second half to beat Northern Heights, 36-28. Despite entering with a 2-6 record, the visiting Wildcats led 20-8 in the first half before the Cobras pulled to within 20-16 at the break. Cooper Williams rushed for a pair of touchdowns for Jackson Heights. Valley Heights 30, Lyndon 22 – Valley Heights held off a fourth-quarter Lyndon rally to win 30-22. The Mustangs led 22-8 heading into the final quarter and a Lyndon touchdown pulled the Tigers to within 22-14. Valley Heights would answer with a long touchdown pass from Cameron Beardsley to Trey Martin to go back up two scores. Lyndon would answer again to pull within 30-22, but the Tigers could not get any closer. Olpe 61, Uniontown 0 – Olpe had no trouble in defeating Uniontown for a second time this season. In their two meetings, Olpe outscored its Eagle counterpart, 109-6. Pleasanton 28, Marion 22 – Pleasanton held off visiting Marion, 28-22. The Blu-Jays picked up their first playoff win since 2008. The Blu-Jays scored twice in the second half to break a 14-14 third quarter tie. Marion scored late in the game to pull within 28-22, but Pleasanton held on for the victory. Centralia 36, Jefferson Co. North 14 – Centralia led 36-0 at halftime in cruising to a 22-point win over the Chargers. Centralia will now prepare for a rematch with Troy. The Trojans led Centralia in the fourth quarter before the Panthers scored twice to win, 36-22. Troy 54, Wabaunsee 21 – Troy rolled to a 54-21 first-round win over Wabaunsee. The Trojans led 33-0 at halftime and cruised to their third straight win. Smith Center 35, Oakley 0 – Smith Center shut out Oakley for a second time this season to advance to the next round. The Redmen led 7-0 after the first quarter and 21-0 at halftime. Smith Center scored 21 points in each half of a 42-0 victory over the Plainsmen earlier this season. Sacred Heart 34, Ellis 7- Sacred Heart backup quarterback Mac Hemmer helped the Knights to a 34-7 win against Ellis. Hemmer threw for 215 yards and three scores as the Knights built a 27-0 halftime lead. Trace Leners had 129 receiving yards and a pair of TDs, while Charlie Skidmore finished with 69 receiving yards and a score. Meade 21, Syracuse 14 – Meade scored twice in the second half to win at Syracuse. The Buffaloes trailed the Bulldogs 14-7 at the break, but Meade scored a pair of third-quarter touchdowns to pick up their fourth win of the season. Plainville 54, Republic County 8 – Plainville cruised to its second win against Republic County this season and won their fifth straight contest. Plainville won at Republic County, 38-6, in Week 5. The Cardinals play host to Ell-Saline next week. Last year, Plainville defeated Ell-Saline, 27-20, in double overtime in the playoffs. Ell-Saline 56, La Crosse 12 - Ell-Saline led La Crosse, 35-0, at the end of the first quarter and 42-6 at halftime. The Cardinals eventually led 49-12 after three quarters, won 56-12 and moved to 7-2. Elkhart 70, Sublette 22 - Elkhart defeated Sublette, 70-22, and led 42-0 after the first quarter. The Wildcats moved to 8-0. Elkhart had a 56-8 halftime lead. Inman 44, Stanton County 10 – Inman jumped out to a 13-0 lead and cruised past visiting Stanton County, 44-10. The Teutons scored twice more in the second quarter to build a 29-10 halftime lead. 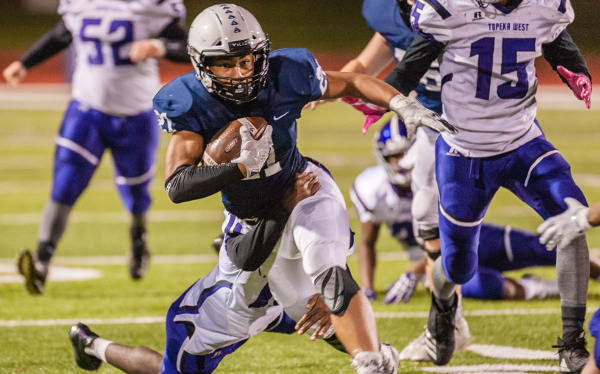 Inman standout running back Matt Ramey did not play in Thursday night’s contest. Argonia-Attica 28, Sedan 8 – A&A scored 20 points in the fourth quarter to break an 8-8 tie in a muddy game at Sedan. The Titans, the fourth-place team out of District 2, rushed for 278 yards in beating the Blue Devils. Blake Harnden led A&A with 102 yards and two scores, while Mason McDaniel added 87 rush yards and a touchdown. Udall 62, Oswego 28 – Udall outscored Oswego 28-0 in the third quarter to turn a 22-20 halftime deficit into a 48-22 lead. Josh Fielder rushed for 181 yards and six touchdowns to lead Udall to its first playoff win since 2014. The Eagles rushed for 382 yards in the game. Madison 46, Peabody-Burns 0 – Madison picked up its first playoff win since 2012 with a 46-0 shutout of Peabody-Burns. Austin Watts rushed for a pair of touchdowns and Ryan Wolgram rushed for a score and threw a touchdown pass to lead the Bulldogs. Solomon 52, Maranatha Academy 6 – Solomon survived the lights going out and rolled past Maranatha Academy, 52-6. Logan Krause rushed for 167 yards and four touchdowns to lead the Gorillas. Braden Neilson added 96 yards passing and a touchdown to Tyler Marfise. Maranatha played without quarterback Nate Burdette who has passed for nearly 1,500 yards and 33 touchdowns this season. South Central 50, Cedar Vale-Dexter 0 – South Central went to the air to defeat Cedar Vale-Dexter, 50-0. The Timberwolves threw four touchdown passes, three by Chayde Snyder, in beating the Spartans. Snyder passed for 69 yards and tossed TD passes to Ethan Jellison, Gage Girk, and Kelvin Mercer. Girk also tossed a touchdown pass back to Snyder. Central Burden 32, Caldwell 12 – Central Burden became the only District 1 team to win the cross-district matchups with District 2. The Raiders beat Caldwell, 32-12. Caldwell led 6-0 at halftime before the Raiders scored twice in the third quarter to lead 16-12. Central Burden added two touchdowns in the fourth quarter to take control. Canton-Galva 54, Lebo 6 – Canton-Galva rolled to a first-round playoff win over Lebo. The Eagles led 24-6 at halftime and added 24 more points in the third quarter to lead 48-6. The victory is Canton-Galva’s first in the playoffs since 2006. Burlingame 70, Bennington 36 – Burlingame scored four consecutive touchdowns in the first half to build a 40-22 lead in beating Bennington. Seth Greenwood rushed for 159 yards and four touchdowns and Montana Giffin passed for four touchdowns to lead the Bearcats. Central Plains 50, South Gray 0 – Central Plains has posted seven straight shutouts in a 50-0 victory in a game that was over at halftime. The Oilers scored 30 points in the first quarter and 20 more in the second. Alex Hickel rushed for two touchdowns to lead the Oilers. Central Plains gets a rematch with Ness City. The Oilers pulled away in the final five minutes to beat the Eagles 30-14 to open the season. Ness City 44, Macksville 20 – Ness City scored three times in the fourth quarter to break a 20-20 tie and beat Macksville for the second time this season. John Pfannenstiel’s 13-yard touchdown pass to Easton Seib proved to be the winning score. The Eagles added an Edwin Rodriguez touchdown run with less than four minutes left a late Angel Guzman touchdown for the final margin. Ness City beat Macksville, 50-28, back in Week 2. Clifton-Clyde 60, WaKeeney-Trego 14 – Clifton-Clyde led 24-0 with 3:56 left in the first quarter and pulled away for the big win. Aiden Rudolph and Drake Steinbrock each rushed for a pair of touchdowns as the Eagles pulled away for the halftime win. Hoxie 46, Hill City 36 – Hoxie led 22-21 at halftime and won in a close contest versus the high-octane Ringnecks. Dylan Weimer rushed for 240 yards and two touchdowns to lead the Indians. Jared Kennedy also passed for 74 yards and a pair of scores – both to Jarrod Dible. Hoxie gets a high-profile matchup versus Clifton-Clyde in the second round. Hodgeman County 38, Moundridge 20 – Hodgeman County bounced back from its upset loss to Ness City with a competitive win versus Moundridge. The Longhorns led 16-14 at halftime and 30-20 after three quarters. Junior Eli Salmans carried 34 times for 201 yards and three touchdowns as Hodgeman County eliminated Moundridge, 38-20. Isaac Salmans added two touchdown runs and also passed for 119 yards in the game. Spearville 54, Little River 24 – Spearville picked up a slight upset over Little River, which entered the game 7-1. The 7-2 Lancers had 490 rushing yards. Carson Rich had 31 carries for 251 yards and four scores to lead three players with more than 100 rushing yards. Spearville gets a rematch with rival Hodgeman County in the next round. St. Francis 46, Stockton 0 – St. Francis earned its fourth shutout of the season and first since Week 4 and remained perfect with first-year coach Nick Fawcett. The Indians scored 16 points in the first quarter and added 30 in the second to end the game at halftime. In the last four years, the Indians have one total loss in Weeks 1-9. Victoria 34, Leoti-Wichita Co. 28 – In one of the state’s best games, Victoria rallied from a 14-0 deficit. Freshman backup quarterback Grant Schoenrock, starting in place of injured multi-year starter Cooper Windholz, delivered a great contest with 15 carries for 134 yards and three scores. Wyatt Dreiling finished with 13 tackles, a fumble recovery for a 15-yard score and a critical late quarterback hurry on fourth down. Leoti sophomore quarterback Kayde Rietzke was knocked out of the contest in the first half with a wrist injury. With 3 minutes, 53 seconds left, Victoria senior Tyler Knoles scored the game-winning touchdown from four yards out on fourth down and then tallied two-point conversion. Leoti got the ball back twice but couldn’t score. St. Paul 62, Hartford 14 – St. Paul scored 44 points in the first quarter in rolling past Hartford, 62-14. The Indians led 56-14 at halftime and ended the game in the third quarter. Centre-Lost Springs 32, Marmaton Valley 28 – Centre captured its first playoff win since 2010 with a narrow 32-28 win over Marmaton Valley. The Cougars will travel to St. Paul next week. Marmaton Valley lost to St. Paul, 62-14, during the regular season. Hanover 54, Southern Cloud 0 – Hanover scored 32 points in the first quarter in cruising to a 48-0 win over Southern Cloud. Taegan Schwartz rushed for two touchdowns to lead the Wildcats. Daiken Stallbaumer rushed for a touchdown and tossed a TD pass to Thomas Atkins. Carter Bruna, Cade Cohorst, and Tyler Bonser also scored rushing touchdowns. Frankfort 30, Beloit St. John’s-Tipton 8 – Frankfort defeated St. John’s-Tipton for the second time in four weeks. Garret Dalinghaus rushed for 112 yards and two scores and Carson Schreiner added 110 yards and a touchdown on the ground. Frankfort won the earlier meeting, 60-14. Waverly 42, Altoona-Midway 0 – Waverly made sure Altoona-Midway’s first playoff appearance in 26 years was a short one. The Bulldogs shut out the Jets, 42-0. Wavery will host Southern Coffey County for a second time this season. Waverly won the first meeting, 58-28. Southern Coffey Co. 60, Wakefield 14 – Southern Coffey County led 36-0 at halftime and cruised to a 60-14 win over Wakefield. Dawson LeimKuhler scored four touchdowns in leading the Titans to their first playoff win since 2004. Mankato-Rock Hills 70, Doniphan West 20 – Rock Hills pulled away from Doniphan West thanks to a huge game from David Gillett. Gillett passed for 249 yards and four touchdowns – all to Rylee Whelchel who had 148 receiving yards. Zane Colson rushed for 117 yards and four scores, added 101 receiving yards, and returned a kickoff for another score. Axtell 58, Pike Valley 12 – Quinn Buessing passed for 137 yards and three touchdowns – all three to Hunter Koch – as the Eagles rolled to a 58-12 win over Pike Valley. Koch’s three receptions went for 97 yards and three scores. With those three touchdown receptions, Koch set a new state record for single-season TD receptions with 30 and career TD receptions with 60. Osborne 48, Triplains-Brewster 0 – Osborne led 16-0 after the first quarter and scored 32 in the second quarter in a game that ended at halftime. Junior Darrien Holloway has 10 carries for 110 yards and four scores. Senior Darnell Holloway had five carries for 112 yards and a score. Sylvan-Lucas 44, Sharon Springs-Wallace County 0 – Sylvan-Lucas steadily pulled ahead with a 12-0 lead in the second quarter and 36-0 in third quarter. The Mustangs have shut out three straight teams and five overall this year. Sylvan-Lucas moved to 6-3 and is 14-5 in the last two seasons. Last year’s 8-2 mark featured three shutouts. South Barber 78, Satanta 14 – South Barber was up 70-6 with 6:06 remaining before halftime and scored 78 points with just under four minutes left in the first half. The 8-0-1 Chieftains have scored 564 points this year and join Hanover as the only Division II teams without a loss. Stafford 54, South Haven 28 – Stafford won the first playoff game in school history and has enjoyed a three-win improvement. The Trojans have tallied 460 points en route to a 7-2 season after 183 points last fall. Dighton 48, Thunder Ridge 12 – Dighton was up 12-6 early in the second quarter before stopping Thunder Ridge near the goal line. Then, the Hornets had a long run from Dalton Hoffman and continued to pull ahead. Dighton, with just nine players, has won seven straight games. Northern Valley 74, Tribune-Greeley Co. 44 – Northern Valley defeated Greeley County, 74-44. The start of the game was delayed by a power outage. Northern Valley scored multiple consecutive touchdowns in the third quarter to pull away. The Huskies have scored 144 points in the last two games and is 4-1 in the last five contests. Otis-Bison 60, Pretty Prairie 12 – Because of heavy rains throughout the day, Otis-Bison’s field had quagmire conditions. Still, the Cougars delivered a big win against Pretty Prairie in the Bulldogs’ second game in Otis this season. Otis-Bison scored 46 points in the first quarter. The Cougars are 7-0-1 since a season-opening loss to Victoria. Central Christian 76, Ingalls 30 – Central Christian, the No. 1 scoring offense in Division II, had another big game from Caleb Lambert. He had 19 rushes for 155 yards and six scores. Lambert has completed 13 of 22 passes for 288 yards and two scores. Richie Oswalt had 11 rushes for 118 yards and three scores. Adam Hall and Marshall Walton combined for nine catches for 260 yards and two scores. Central Christian had 290 rushing and 288 passing yards. Golden Plains 67, Moscow 33 – Dylan Spresser rushed for 211 yards and four touchdowns as Golden Plains beat Moscow, 67-33. The Bulldogs advance to the 6-Man semifinals where they will take on Ashland. Caleb Korte added 127 rushing yards on nine carries for Golden Plains. Pawnee Heights 118, Cheylin 85 – Pawnee Heights defeated Cheylin, 118-85, in possibly the highest scoring game in Kansas state history for all levels. Pawnee Heights senior Kade Scott scored 14 touchdowns. Cheylin standout sophomore quarterback Colton McCarty finished with 12 total scores, including 226 passing and 252 rushing. Last year, Pawnee Heights beat Cheylin for the six-man state title.